The name of John Benbow does not leap readily to mind, even to the mind of an Englishman, when considering maritime heroes. Nelson, yes; Blake, yes; Anson, Vernon, Hawke and Jarvis, all yes; but not Benbow. Apart from lending his name to the tavern at the beginning of Robert Louis Stevenson’s famous novel, “Treasure Island,” Benbow would appear to have little claim to everlasting fame. Nevertheless, hero he most certainly was and the prime participant in one of the most unhappy events in British naval history. John Benbow started life in 1653 in the county town of Shrewsbury in Shropshire as the son of a humble tanner. Legend has it that he was apprenticed to a butcher but, hating the trade so much, he ran away to sea. Little is known of his early career though he would have joined as an ordinary seaman, subject to all the rigours and privations common to that rank. He must have been good at his job for at the age of 25 he was serving in the Mediterranean as master’s mate. His skill in navigation brought him to the attention of Admiral Herbert who promoted him to full master. The young mariner did, however, have an unusual, some would say, unfortunate, sense of humour which occasionally got him into trouble with his superiors. HMS Adventure, under the command of a Captain Booth, once spent all day engaged with a pirate vessel from Algiers, pounding each other to match wood. The enemy ship, named the Golden Horse, had lost over a hundred of her crew, all her masts and the water level was creeping ever higher in her hold. Despite her sorry state she refused to surrender. As night fell a third ship appeared in the scene – flying a Moorish flag! The arrival of a second enemy ship coursed Captain Booth to spend a sleepless night as he was in no condition to take on a fresh enemy. Morning revealed the newcomer to be HMS Nonsuch, who calmly ran out her guns and forced the surrender of the pirates. The Moorish flag had been a joke, the humour of which Captain Booth, understandably, failed to appreciate. For some reason blame for this escapade seems to have attached itself to Master Benbow. The incident with Captain Booth was to cost Benbow his position and he drifted out of the Royal Navy. For a while he disappears from the pages of history but soon surfaces as a captain of a merchantman. He was attacked by a Moroccan corsair out of the North African port of Sallee and, after a hot, closely contested fight, Benbow proved victorious. Such was the feeling in Spain against the Moorish pirates that the Spanish King paid a reward for the heads of the enemy! Benbow duly collected his gruesome harvest and sailed to the nearest Spanish port. An account of his exploits was recounted to the King of Spain who wrote to his fellow monarch, King James II of Great Britain. By 1688 he was back in the Royal Navy as a ship’s captain under the command again of Admiral Herbert. As the political situation over James II’s conversion to Catholicism degenerated in to the Glorious Revolution, Benbow was appointed Controller of His Majesty’s Dockyard at Chatham. Despite his administrative role, Benbow was frequently called to sea command and took part in engagements against the French at Beachy Head and Barfleur. After Admiral Russell’s victory at Barfleur twenty French ships under the command of Admiral Tourville managed to escape and took shelter in the dangerous, rock-bound harbour of St. Malo. Safe behind their rocky fortress the French would sally out to attack English merchantmen at their will. In the late 1680’s France had developed the Galliot or Bomb-Ketch. The mortar, used in siege actions, did not lend itself to naval warfare because of its intense, downward recoil. The French built a ketch with a very broad beam and only a main mast and a misen mast. The mortar was mounted on the unencumbered bow and sat on a mass of tangled and waste rope to absorb the shock of firing. Ever quick to take hold of a new idea, the Royal Navy built a hundred of these ketches. The mortar could lob up to 200 pounds of iron, shot, chains and any other missile into a fortified coastal position while the largest canon ball that could be used to breach a wall was a mere forty pounds. Sir Francis Drake had used fire ships to breed havoc in the Spanish Armada in 1588. This sometimes hazardous weapon had been developed in to a more dangerous bringer of death and destruction. It was called the Machine or Infernal and had been originally formulated by the Dutch. The vessel took the form of a barque crammed with upwards of a hundred barrels of gunpowder, roofed over with a ceiling of planks and covered with thatch, faggots of wood, pitch, tar, resin; in short, anything that burned. On top of all that came the missiles. Canon-balls of iron and stone, bombs, iron chains and shells were wrapped in tarpaulin. Benbow was given the job of rooting out the thorn in England’s side. He arrived off St. Malo in the middle of November 1693 and immediately started pumping mortars over the wall in to the town and among the sheltering French ships. This continued for three days and on the fourth night he prepared to send in the first Infernal ever used by the Royal Navy. Benbow intended to manoeuvre the barque under the town’s sea wall but it struck a rock and the engineers were forced to light the fuses and row for their lives. The vessel burned for some time but eventually blew up. The force of the explosion rocked the town like an earthquake. It blew the roofs off three hundred houses and broke all the glass and earthenware for miles around. The capstan, which weighed two hundred pounds, flew in to the air and, when it landed, completely levelled a house. Large parts of the sea wall collapsed. If Benbow had had a force of Marines he would undoubtedly have been able to take the town. He was given the task of repeating his success at Dunkirk but the Infernal proved less effective and the Admiralty dropped their use. The Peace of Ryswich in 1697 brought an end to this particular conflict between William III and Louis XIV and the navy turned its attention to the problem of pirates in the West Indies. The government engaged the services of a New York Shipmaster by the name of William Kidd and fitted him out with ship and arms to infiltrate the ranks of the buccaneers. Unfortunately Kidd turned native, hoisted the “Jolly Roger” and joined the freebooters. Admiral Benbow was sent to bring the malcontent to justice. He failed to find Kidd but got embroiled in local politics. 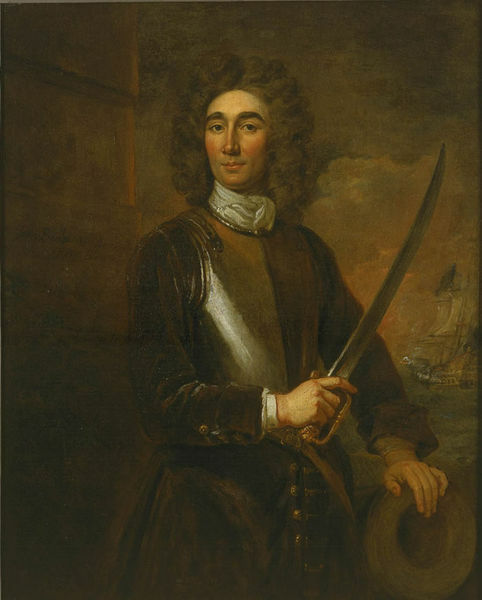 He gave his backing to a trading venture, put together by a group of Scotsmen, which threatened the position of both the East India Company and the South Sea Company. Jealousy from English merchants, malaria and the refusal of Jamaica to supply the expedition proved its downfall. Benbow managed to avoid blame and returned to England. On the first day of November 1700 Benbow’s old admirer, the King of Spain, died. Ever the opportunist, Louis XIV saw this as a chance to expand French influence over Spanish America. To be stationed in the West Indies was regarded in a similar vain as the Eastern Front in the German army in the Second World War. Disease and climate took a terrible toll of life and it was a posting to be avoided. King William, himself, approach Admiral Benbow and asked him to take up the challenge. “If we cannot persuade our beaux, we must turn again to honest Benbow,” the King pronounced. Benbow was at Barbados by the end of 1701 in good time to sort out his command before the outbreak of the War of the Spanish Succession. His presence prevented the French from taking quick action and the French fleet under Du Casse did not arrive until the summer of 1702. Benbow discovered that Du Casse intended to take Carthagena and sailed his fleet along the northern shore of South America. He found Du Casse off Santa Marta on 19th August. Benbow had a fleet of seven ships while Du Casse had ten though several were in need of refit after the voyage across the Atlantic. On finding his pray Benbow resolved to engage the enemy immediately. Unfortunately some of his ships were four miles astern of his lead. The Defiance and the Windsor were so slow in coming to his call that he was forced to signal them to make all speed. As a result it was almost evening before the battle line was formed. Captains Kirkby and Constable were so reluctant for the endeavour that a couple of broadsides from the French sent them turning away and leaving the battle. Benbow was furious. Throughout the night the Admiral, on board his flagship HMS Breda, kept in contact with the French and come morning the only other ship to support him was the Ruby. Undaunted, the Breda and the Ruby attacked but the small Ruby took heavy punishment and Benbow was force to protect his injured comrade. The Defiance and Windsor came up to the battle but stood back and did not join. So the engagement continued with Benbow and the disabled Ruby harrying the enemy while the other English ships showed much activity but little substance. At one point the Greenwich was nine miles astern of the fleet. By the fifth day of this running battle the Ruby was in no condition to continue and Benbow granted her gallant captain leave to head back to Jamaica. The Defiance, Windsor, Greenwich and Pendennis now had an opportunity to redeem their inactivity but merely fired one broadside a the French and retired. A captain’s council was called on board the Breda and all were unanimous for discontinuing the action. Weakened by his terrible wounds, Benbow had no choice but to return his fleet to Jamaica. Despite the amputation of his leg Benbow was determined that justice be done to his cowardly subordinates. Captain Hudson may be regarded as fortunate for he died soon after reaching Jamaica. Captains Kirkby, Wade and Constable were charged before court-marshal with cowardice, disobedience and neglect of duty. Constable was acquitted of cowardice but was dismissed the service and ordered to be imprisoned at Her Majesty’s pleasure (by now Queen Anne had ascended the throne). He died in prison. Kirkby and Wade were convicted on all charges and condemned to death. They were sailed back to England on board HMS Bristol and shot by a Marine firing squad at Spithead off Portsmouth. The Royal Navy refused to allow them to contaminate English soil. Both Fogg and Vincent were charged with conspiracy and suspended the service but, because of their creditable action in the battle, were reinstated as captains. Captain Walton of the Ruby was commended for his bravery and lived on to render his country valuable service and died of old age, full of honours. I had little hope on Monday last but to have supped in your cabin, but it pleased God to order it otherwise. I am thankful for it. As for those cowardly captains who deserted you, hang then up, for, by God, they deserve it! Benbow was destined never to see his home again. The amputation brought on a fever and he breathed his last in early November; his resting place being in Jamaica under a dull plain slab of grey stone. There has been much discussion on the motives of the cowards. Benbow was undoubtedly a forthright and outspoken commander. He did not suffer fools. Some have suggested him a bully though there is no evidence. The primary reason for the attitude of the subordinate captains would appear to have been prejudice. In a time when captains bought their commissions, Benbow came from common stock. He had gained his Admiral’s pennant by merit and merit alone. He had the trust of his King and his fellow admirals. He had the misfortune to find himself with inferior subordinates.